"The Living Double Of A Single Fiction"
Superman stands deep in S.T.A.R., surrounded by glass globes.�Dr. Welbourne appears in the doorway and introduces himself.�Superman asks what happened to the people contained in the globes, and Welbourne tells him about the Anti-Chromatic Syndrome that has been striking metahumans down.�Before Superman can say another word, a team bursts though the door bearing yet another black-and-white hero.�Superman looks at the small boy for a moment, and then remembers where he knew the boy from. Heroville. Inside the formerly idyllic town, citizens lie everywhere, struck down with the mysterious condition.�Superman arrives suddenly, with four S.T.A.R. Labs workers in tow.�As the scientists begin to study the victims, Superman takes off into the sky.�Kal streaks to Dr. Camel's house.�Inside, he finds the house torn apart.�A lone woman lies on the ground, devoid of any pigment.�He suddenly hears someone yelling not far away. In the middle of a street Dr. Camel, clad in a jumpsuit and sporting an energy weapon, threatens the three men approaching him.�Superman darts down to join the Doctor, but the Doctor screams for him to leave.�The eyes of the attackers glow and suddenly Superman finds himself inside of a prism.�He moans that there is no hope, when the three attackers are knocked aside by a blast from Dr. Camel's canon.�Gathering up Superman, Dr. Camel hoists him on his shoulder and blasts off into the sky with his jetpack. Landing across town, the S.T.A.R. techs check Superman out while Dr. Camel explains the source of the problem.�The three men surround their victim and siphon the life out of them.�Dr. Camel says that there are still survivors in Heroville.�Taking off into the sky, Superman tells the Dr. to help the Techs out while he searches for anyone else. Across town, Superman finds a boy hiding in a tree house.�The boy comes out and introduces himself as Kid Scout, but then points to the yard where the three attackers are standing.�Superman and Kid Scout are in the air as their eyes start glowing.�Among the clouds, Kid Scout asks who they were, and Clark thinks back to the past. In the 1950s author Ben Conrad tries to convince his editor that he can write a book about a group of men trying to preserve a world without passion or heroes.�He gets the go ahead, but after it is published The Hollow Men just sits on the shelves.�Years later young Clark Kent is reading another book by Benjamin Conrad when one of his teachers sees him.�He tells Clark of another book by the author, and heading to a shelf he pulls out a copy of the book. 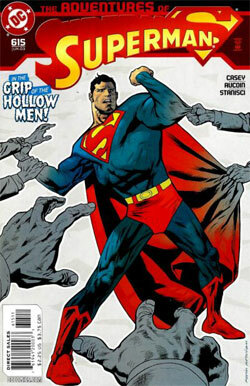 In the present, Superman suddenly realizes what is happening.�Touching down near everyone else, he tells them that the attackers are known as the Hollow Men and that they are from a 1950s fictional story.�He knows the author, and the last time the author tried writing fiction the character came to life.�Clearly the same thing has happened with this book too.�However, that book was only a manuscript and could be deleted easily.�The Hollow Men exist everywhere. Dr. Camel says that they will need to find Conrad, but Superman says he can't leave them alone in Heroville.�Just then Kid Scout pipes up and volunteers for the task. With his powers he can find anyone, anywhere.�Superman considers for a moment, and then tells the boy to be careful and wishes him luck.�After Dr. Camel points him toward the tesseract exit, Kid Scout takes off running. Hours later the Kid still has not returned.�Looking over the city they can see a glow coming from another part of town.�Superman tells them all that the Hollow Men are burning books.�These men can do more than inflict the disease; they can steal their ability to dream of a better world.�If they aren't stopped they will remove all sense of hope from the world. Story - 3: I'm not a big fan of the Heroville concept.�I think the DCU has enough metahumans as it is without throwing a few hundred more into the mix.�However, I'm going to try to ignore that for the purpose of this review.�The hollow men are interesting, if not great villains.�Casey is trying to give us a variety of villains that aren't your standard, and I appreciate the offer. However, a triad of monochromatic men from the 50s isn't really what I like to read.�Still, for the course of the story it works.�Kid Scout and the others seem to be thrown in just because there is an opportunity to create new characters, and they just don't seem important enough to do so.�If they vanish after the arc then fine, but otherwise it's just not going to work.�This issue also had some holes.�It is daytime when Superman rescues Kid Scout, but dark out when he gets back to camp?�Also, it mentions the trials of the JSA.�I'm pretty sure that this only happened in the Elseworlds "The Golden Age" (which is absolutely fantastic, I recommend you pick it up).�If I'm wrong then I'd appreciate the correction, but if not then this bothers me as well.�This issue also moved way too slowly.�He's at Star Labs and then he heads to Heroville where he meets the doctor, saves Kid Scout, figures out who the Hollow Men are, and then sends Kid Scout to find Conrad.�The whole storyline has just felt long and drawn out so far.�Despite all of this griping the storyline is intriguing and definitely a change from the status quo.�I want to see how it turns out next issue before I decide on the story as a whole.�This issue though just left me apathetic.�I didn't really like it but I didn't hate it either.�Pretty average. Art - 2: The art really didn't do anything for me though.�Every page is too dark for my taste, with the inking done way to heavily.�Superman's face looks completely wrong, and scenes and backgrounds have little to no detail.�I do like that I can tell what is going on (not always a guarantee lately) but the whole issue is just too heavy on the inks.�Maybe if they were toned down I would like it, but as it stands it really did nothing for me. Cover Art - 2: And then we reach the bottom of the barrel.�First off, there is no background.�I realize the theme of this issue, and therefore the black and white background, but still, the constant lack of background detail is horrible.�Secondly, and primarily, they let Nowlan do a cover again.�Ever since DC 1st: Superman/Flash I have disliked his art.�Superman's legs are anorexic and his chest is too big.�His ribs look like they are going to puncture his skin any moment and his facial expression is just stupid.�The only redeeming factor of this cover is the color bleeding away from Kal where he is being touched and the fact that there are three hollow men and six hands on the cover.�Finally some accuracy in a cover.�Regardless, the art is just horrible and the cover is boring.�If the interior artists can't handle doing covers then they could at least get someone good.�I'm sure there are people out there who would sign on to be cover artists.�Why can't they get one or two for Superman?